My column for ConHome: Why the Lib Dems have no alternative but to fight the 2015 election from the centre. My third column for ConservativeHome — The Other Side — ran this morning. You can read it here (and enjoy the comments from readers who aren’t, in the main, Lib Dems) or below. I’m enjoying the gig, and kudos to ConHome’s editor Paul Goodman for allowing a Lib Dem a regular slot on the site. The night the Coalition was formed I was sat in a hot, airless BBC studio in Oxford taking part in a live Radio 4 discussion about what it all meant. I was on my own, with the presenter and other guests at Westminster, which meant they often left me out of the discussion. This can happen if you’re ‘down-the-line’. Or a Lib Dem. The combination is a double-whammy. Eventually, after 20 minutes of being ignored I phoned the producer to find out if they still needed me. “Oh, are you still there?” came the half-apologetic reply. Secondly, we knew (or should have known) that the Coalition was going to be tricky for us: the junior partner always gets squeezed, the more so in a winner-takes-all electoral system. Choose the Conservatives and our left-leaning voters desert us. Choose Labour and our right-leaning voters peel off. Choose neither and everyone disses us. And thirdly – the hardest part of all – the Lib Dems had (and have) no alternative but to make the Coalition go the distance, to make it work. True, we could walk away, let the Conservatives govern alone, and make Peter Bone’s dreams come true. But this would serve to confirm two suspicions in the minds of a chunk of the British public. First, that my party lacks the necessary backbone when the going gets tough. And secondly, that coalition government might be okay for those continental-types, but it’s just not the British way, dammit. From that day on, 11 May 2010, the Lib Dem strategy for 2015 was defined. It wasn’t defined by us: it was defined by our situation. We became, instantly, a party of the centre. It’s a phrase few of my fellow Lib Dems like. For years we’ve railed against it, pointing out (justifiably) that liberalism is neither left nor right, but is its own distinct and radical philosophy. To many activists being in ‘the centre’ suggests we’ve become a party that’s content with wishy-washy, please-all-the-people, split-the-difference mushiness. Yet the reality is it’s precisely because we are perceived to be moderate centrists that many of the electorate vote for us. And if we are to continue as a party of government – which almost three-quarters of Lib Dem members would like us to do – then we will have to do a deal next time with either the right-leaning Tories or left-leaning Labour. We may not place ourselves in the centre, but our circumstances do. We need to make the best of it. ‘A stronger economy and a fairer society, enabling every person in Britain to get on in life.’ That’s the strapline Nick Clegg’s top strategy advisor, Ryan Coetzee, has developed and which is being ruthlessly branded across all the party’s communications, from the local Focus leaflet to national keynote speeches. It is explicitly middle-of-the-road. ‘Smarter than Labour, less horrid than the Tories,’ is the clear read-between-the-lines message. It’s based on extensive private polling conducted for the party (something we’ve never previously done) focused on winning back our more persuadable 2010 supporters, as well as encouraging moderate Labour and Tory voters to switch. Some activists dislike it intensely – but it’s a slogan aimed at the voters, not us. By default, therefore, the Lib Dem strategy for the next election is already in place. It was put in place the moment we decided to join the Coalition. We’ll fight 2015 from the centre because there’s no other position from which we can credibly fight it. The Conservative strategy is also now fixed. 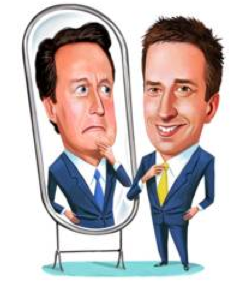 Throughout this parliament, there has been a permanent tension between what I’ll characterise as the Good Angel of Cameron modernisation and the Bad Angel of the party’s right-wing core. (I realise, dear reader, you may characterise it slightly differently.) Mostly the Bad Angel has won and Lynton Crosby’s appointment has confirmed the victory. The Conservatives opposed AV, and by doing so exposed themselves to the threat of Ukip; the party opposed Lords reform and thereby lost the boundary changes so crucial to its chances in 2015; it’s re-discovered the joys of banging on about Europe to the indifference of most voters; and it’s convinced the election can be won by promising further harshness against immigrants and welfare recipients, even if doing so turns off ethnic minority and moderate voters. As I’ve highlighted before, this is a victory for the Tories’ own 35% strategy. It’s perfect for winning back Ukip voters, lousy for winning the next election. It is, though, undeniably a strategy. Labour, by contrast, continues to muddle its way through, attacking Coalition policies furiously – from the public sector pay freeze to the bedroom tax to tuition fees – before later admitting it would keep them, maybe. But back to the Lib Dems. The good news is we have a strategy for 2015: we are, for good or ill, the party of the centre. The bad news is we have no idea if this strategy will work. As a party we’re sanguine about sagging mid-term poll ratings: been there, survived those. As Paddy Ashdown regularly reminds us of the post-merger party’s standing: “I am the only political leader in modern British history who has presided over an opinion poll rating represented by an asterisk – denoting that no detectable support could be found for us anywhere in the land!” What we’re not used to is polling so dismally in local elections. That’s a new one on most of us, and we’ve discovered it’s not much fun.